Historians and activists unveil a plaque commemorating a labor battle that has implications for today. 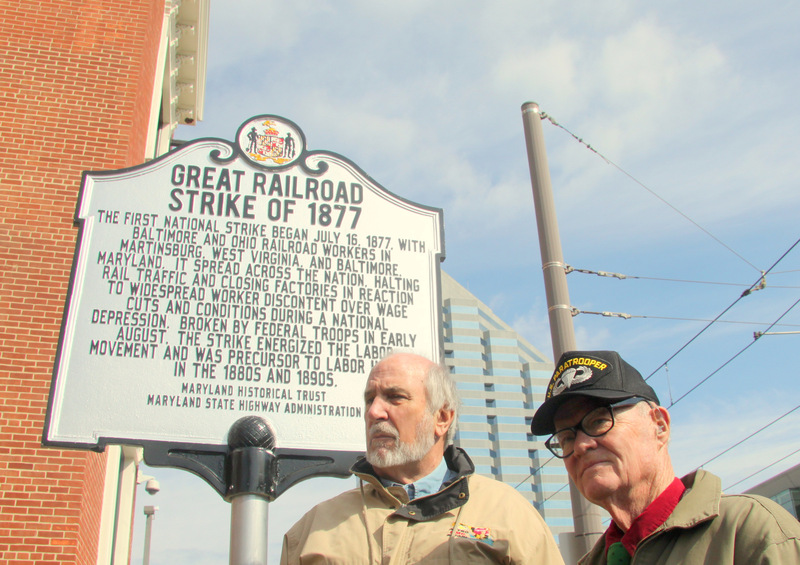 Above: Bill Barry and Thomas Ward, at Camden Yards, for the dedication of the historical marker for the railroad strike of 1877. Most of the historical plaques at Camden Yards are about particular players’ home-runs or Babe Ruth’s father’s tavern, but a new marker outside the ballpark pays tribute not to ballplayers but to workers whose names we’ll never know. Unveiled yesterday, the sign on the Howard Street side of the old Camden train depot recalls the tens of thousands of people who joined in the Great Railroad Strike of 1877, a protest against pay cuts and poor working conditions that started in Baltimore and Martinsburg, W.Va., then spread across the country, halting rail traffic and factory production and helping to launch the modern labor movement. More than 100 people died in the unprecedented labor action against the Baltimore & Ohio and other railroads. 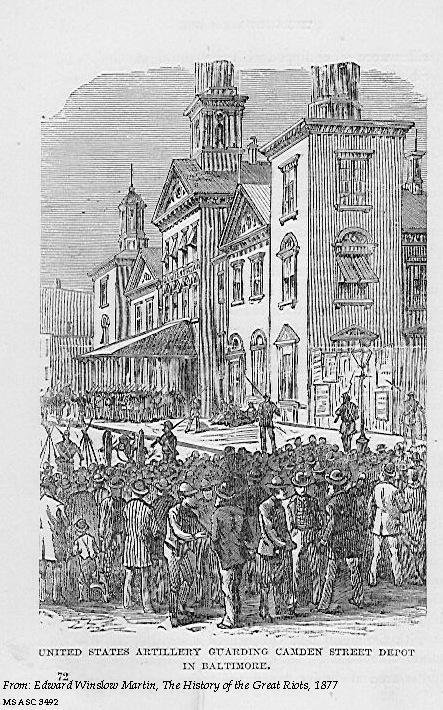 There was fierce fighting outside Camden Station and across the city, including 11 people shot to death by the 6th Regiment militia near City Hall, one of them an 11-year-old newsboy. “Most were immigrants and illiterate, so we have no record of them,” said Bill Barry, recently retired head of Labor Studies at the Community College of Baltimore County, Dundalk, speaking at yesterday’s ceremony. Barry, who ignited interest in the story during the 2011 Occupy Baltimore protests, found collaborators to help him give the event some official recognition and a historical marker. Many of those people were among a crowd of about 40 at yesterday’s unveiling, listening to Barry’s remarks, which were at points drowned out by the sound of the light-rail cars rushing by. 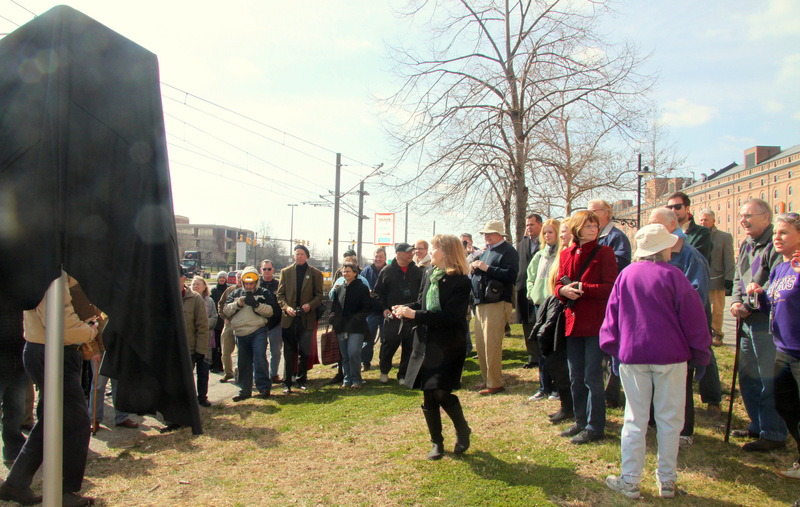 The participants included Nancy Kurtz from the Maryland Historical Trust and Jan Hardesty, from the Maryland Stadium Authority, as well as retired Judge Thomas Ward, a founder of the Irish Railroad Workers Museum on Lemmon Street, where the group reconvened after the ceremony. Barry also cites Steve Hall, Eddie Gilyard and Paul Stout of the Maryland State Highway Administration as key players in the process of getting the state-funded marker installed on the west side of Howard Street, just south of the Camden Street intersection. The crowd also included Viva House co-founders Brendan Walsh and Willa Bickham, and members of the Charm City Labor Chorus. 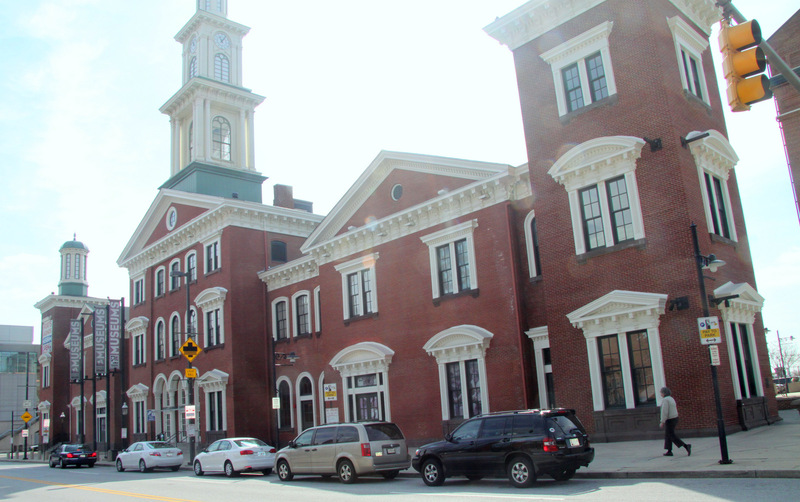 The strike took place mid a post-Civil War recession, high unemployment and general discontent over working conditions and management attitudes on the B&O, then Baltimore’s largest employer. 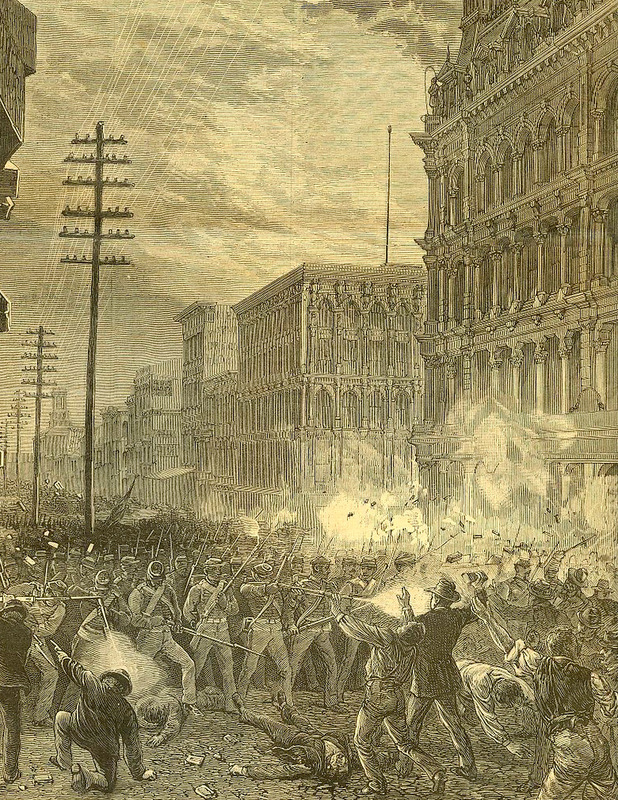 Infuriated employees and sympathizers injured several members of the militia, damaged locomotives and rail cars, and burned portions of Camden Station. “The stoppage exploded into the country’s first national strike, an epic event in working-class history which created a spontaneous solidarity. “Within the week, more than 100,000 workers in fourteen states had gone on strike, smashing cars and pulling up tracks in large cities like Baltimore, Boston, Chicago, St. Louis, Toledo, Louisville, Buffalo, and San Francisco, as well as in dozens of small railheads, like Martinsburg and Keyser, W.Va., Zanesville, Ohio, and Marshall, Texas. “The railroad strikes were only one major industry whose workers struck during the summer of 1877. Canal boatmen on the Chesapeake & Ohio Canal, mineworkers in Pennsylvania and Illinois, box makers and tin workers in Baltimore, and even laborers and black washerwomen in Galveston, Texas, all struck. “Black sewer workers in Louisville, Ky., called a strike that within three days involved coopers, textile workers, brick makers, cabinet workers and factory workers.